Tetravus gets three +1/+1 counters when cast. During your upkeep, you may move each of these counters on or off Tetravus. 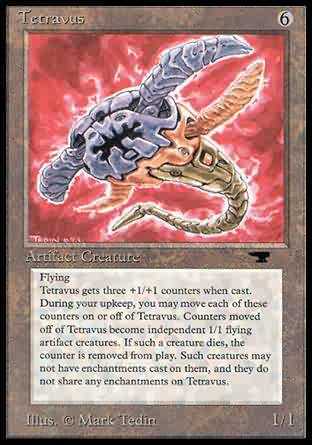 Counters moved off of Tetravus become independent 1/1 flying artifact creatures. If such a creature dies, the counter is removed from play. Such creatures may not have enchantments cast on them, and they do not share any enchantments on Tetravus. Tetravus comes into play with three +1/+1 counters on it. At the beginning of your upkeep, you may remove any number of Tetravites created with Tetravus from the game. For each Tetravite removed this way, put a +1/+1 counter on Tetravus. Then you may remove any number of +1/+1 counters from Tetravus. For each +1/+1 counter removed this way, put into play a 1/1 Tetravite artifact creature token with flying and with "Tetravite can't be enchanted."